President Xi Jinping has ascended China’s political mountaintop and is imposing his will on both the Communist Party and Chinese people. His time spent in America did not turn him into a liberal: under him the People’s Republic of China has taken a sharply authoritarian direction. What the PRC does at home no doubt concerns freedom-loving people around the world. Nevertheless, it comes as no surprise and China remains far freer today than during Mao Zedong’s rule. But Beijing’s domestic policies matter more when applied to nominally autonomous Chinese territories, most notably Hong Kong. The latter is not only the economically freest land on earth. It also is governed by law, not men, and protects basic liberties. But that appears to be changing, for the worse. Seized by Great Britain from the decrepit Chinese Empire, the territory was returned in 1997. Beijing promised to preserve its unique characteristic as a Special Administrative Region. Little changed for many years. But the 2014 Umbrella Revolution featured youth-driven demands for the impossible: democratic selection of the SAR’s political leaders. Protests ended with a political impasse. Intrusions in Hong Kong’s autonomy have since increased. In 2015 several publishers critical of the PRC were arrested by Chinese authorities in seeming violation of international law. Last year two independence-minded activists were blocked from taking their seats in the legislative council after highlighting their contempt for Beijing while taking their oath of office. The National People’s Congress joined the controversy and the Hong Kong authorities then challenged the election of another four political activists. 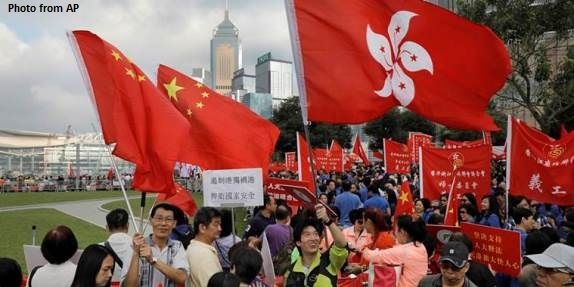 In July President Xi visited Hong Kong to mark the 20th anniversary of China’s takeover and made clear his government would not tolerate support for independence. In August three leaders of the Umbrella Revolution were sentenced to prison for their role in protests three years before. Now the territory’s Legislative Council is expected to approve legislation pushed by Beijing to criminalize showing disrespect to China’s national anthem, which is shown at Hong Kong sporting events. Participants at soccer matches have booed, chanted, and waved banners against the PRC. The measure provides for a prison term up to three years imprisonment. Exactly how the measure would be enforced is unclear. Hong Kong would face the embarrassing question of whether it is willing to jail its citizens for what is pure free speech. Much will be at stake in how it answers. As China grows stronger it needs to learn the value of forbearance. Beijing has the power to do most anything that it wants in Hong Kong. However, prudence counsels for less rather than more. First, Hong Kong is the canary in the mine for Taiwan. Most Taiwanese, especially young people, do not identify with the PRC. Why would they choose to be ruled from Beijing? To accept even a looser connection would require trust in the central authorities. What is occurring in Hong Kong is not reassuring, however. With a robust democracy, the Taiwanese people have even more to lose. Second, the status of Hong Kong is an indicator of Beijing’s respect for international law. London never had the means to enforce its agreement with the PRC over Hong Kong’s return. However, the resulting pact was a symbol of China’s maturity. To ostentatiously toss aside the SAR’s most important liberties would demonstrate a worrisome mix of arrogance and impatience, sure to concern the PRC’s neighbors. Third, targeting symbolic opposition rather than substantive resistance guarantees organized disobedience with public support. Plenty of Hong Kong residents oppose independence, or at least the pursuit of independence against the PRC’s wishes. But they also believe in allowing people to express their views freely. Going after those deemed disrespectful toward China would be a nightmare. Fourth, Beijing needs to fight for the fabled hearts and minds of Hong Kong residents. Repression makes the PRC even less attractive, especially to young Hong Kongers. Legal dissent is the equivalent of a popular steam valve, releasing public pressure. China has sufficient security forces to “win” any confrontation in the streets. But coercion and violence would be devastating to the PRC’s international reputation. With great power comes responsibility. So it is with China in Hong Kong. Officials not used to opposition in Beijing bridle at criticism further from home. But instead of attempting to stifle dissent in Hong Kong, they should channel criticism to more productive ends, while demonstrating why the PRC is an attractive overlord. China will only lose in any confrontation.